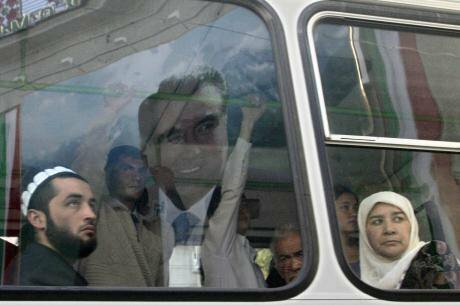 Travellers on a bus in Dushanbe look through the window at a massive portrait of Tajikistan’s president Emomali Rahmon. (c) Sergei Grits / AP / Press Association. All rights reserved. Emomali Rahmon has ruled Tajikistan for 21 years. This mountainous Central Asian country is one of most repressive states in the post-Soviet space. This situation is unlikely to change for the better. Amendments to Tajikistan’s constitution passed in a referendum earlier this year have removed the limits to the number of presidential terms. After Kazakhstan’s Nursultan Nazarbayev, Rahmon is the second leader in the region to remove obstacles to lifetime rule. The country’s opposition and independent media are under fierce pressure (link in Russian), while Rahmon’s opponents are often accused of links to Islamist terrorists. In 2015, roughly 200 opposition activists were sent to prison. In October this year, Buzurgmekhr Yorov and Nuruddin Makkhamov joined them. Yorov, a lawyer, was sentenced to 23 years in prison, and Makkhamov, a rights defender, received a 21-year sentence. These men had defended the Islamic Renaissance Party of Tajikistan (IRPT), which the country’s authorities banned in September 2015. Prior to the ban, the IRPT was the only legally operating Islamic political party in the entire region. As Tajikistan’s dissidents know all too well, the country’s security services can reach them anywhere. One evening in March 2015, Umarali Kuvvatov, a Tajik opposition activist, was shot dead in Istanbul. Kuvvatov was the founder of Group 24, a movement that tries to unite Tajikistan’s dissidents living in exile. A year and a half later, dissidents from Tajikistan still can’t breathe easy. Shabnam Khudoydodova, a former member of Group 24 (link in Russian & Tajik) and now an independent activist, knows this all too well. As we sit over a cup of coffee in one of Poland’s largest cities, she tells me her story, and how even here, she still doesn’t feel safe. Shabnam’s had to get used to being on the move. She was born in 1986, in the southern town of Kulob. Long interested in journalism (her father’s profession), she tried to build a career as a reporter, but to get hired, she had to pay a bribe — and she couldn’t afford it. Unable to find other work, in 2008 she left for Russia, and returned to Tajikistan only to pick up a new passport. Many Tajik citizens have to leave their country to find work. It’s one of the poorest states in Central Asia, and remittances make up 29% of the country’s GNP (2015). 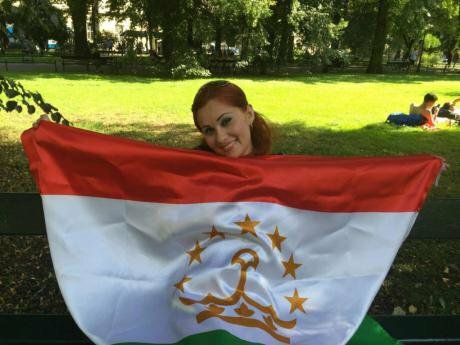 Activist Shabnam Khudoydodova with the flag of Tajikistan. Image: Shabnam Khudoydodova. Shabnam took a job as a saleswoman, and turned her attention to the fate of Tajik women working in Russia. She started a blog to share her impressions, and soon after, began to show more and more interest in politics, associating with Tajik dissidents abroad. Eventually, she became a member of Group 24, participating in several demonstrations across Russia. Shabnam emphasises to me that Tajik migrant workers in Russia are interested in the activities of dissidents at home and abroad. But that doesn’t meant they always share the same political convictions. As it turned out, Russia wasn’t so interested in the fate of dissidentsfrom its “near abroad”, even within its own borders. In January 2015, one of the high-level activists from Group 24, Maksud Ibragimov, was kidnapped in Moscow and illegally extradited to Tajikistan. He had been seriously wounded by unknown assailants in 2014, and the authorities removed his Russian citizenship in December that year. Ibragimov had lived in Russia for 10 years, and had renounced his Tajik citizenship in 2004. Last May, another of Shabnam’s acquaintances went missing. Ekhson Odinaev, a blogger and member of Group 24, was abducted (link in Russian). According to human rights defender Nadezhda Ataeva, Odinaev had been hiding in his apartment in St Petersburg, and practically didn’t leave the house before he disappeared — Ataeva believes that Tajikistan’s security services could be involved (link in Russian). Odinaev hasn’t been heard from since. It seems the international law enforcement agency has played an important role in supporting Central Asia’s authoritarian regimes in stopping their most troublesome citizens running too far. Interpol’s so-called “red notice” is issued at the request of a given state. It demands the detention of the person indicated in any country of the world, and subsequent extradition back to the requesting country. According to Steve Swerdlow, a researcher on Central Asia at Human Rights Watch, Shabnam is on this closed list. Shabnam’s legal advisors in Europe have also confirmed this to her. “What kind of terrorist am I?” she exclaims. My request for confirmation from Interpol went unanswered. “Shabnam Khudoydodova’s case raises a multitude of questions, about both the role of Interpol and the clear close co-operation between security services across the post-soviet space”, Swerdlow told me. “Her case is just one of several examples of the brutality with which central Asian regimes treat dissidents”, adds Marius Fossum, representative in central Asia for the Norwegian Helsinki Committee. “Putting pressure on the relatives of exiled dissidents back at home is a widespread tactic across central Asia. In fact, I know of several other cases”, he continues. Both researchers claim that the persecution underway in Tajikistan is the fiercest since the end of the country’s civil war in 1997. From January 2015, Shabnam was reluctant to leave her apartment in St. Petersburg, believing (not without some basis) that she was under surveillance by security officers from Tajikistan. A few close calls with the Tajik security services in the city eventually prompted her to flee Russia. After the murder of Kuvvatov in March 2015, Shabnam decided to change apartments. From April, unknown men began to follow her openly in the streets. Then, at the end of May, she confronted them — Shabnam left the house only rarely at that point, but this day was an exception, as she was visiting her sister. “I noticed him,” she says, “he was photographing me. Right on the street near a park. It was a gloomy day in St. Petersburg, and this man was standing in the middle of the street, in the rain. 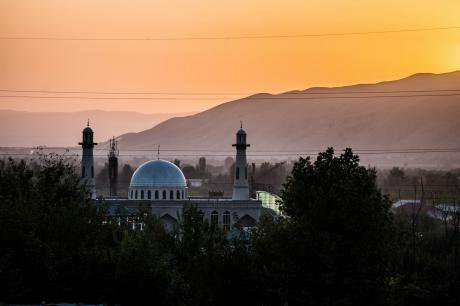 Sunset in Kulob, southern Tajikistan. CC-by-NC-2.0: Ronan Shenhav / Flickr. Some rights reserved. Towards the end of May, Shabnam heard footsteps following quickly behind her as she climbed the stairs to her apartment. Slamming the door behind her, the visitor began to ring the doorbell. Shabnam didn’t respond, so the man knocked on her neighbours’ door. “Who lives in the apartment next door?” he asked. “Oh, that’s Irina’s place,” responded the neighbour. Through the peephole, Shabnam watched as he reached into his pocket and produced some identification. At the insistence of international human rights organisations, the Belarusian authorities eventually let Shabnam go, and she traveled to Poland. Shabnam intends to continue her human rights work on the situation in her country. She’s far from Tajikistan now, but even that has its price. 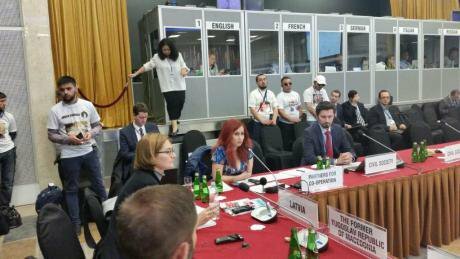 In September 2016, she took part in the OSCE’s HDIM conference in Warsaw, together with representatives of the Tajik opposition. It’s Europe’s largest annual summit on democracy and human rights. Official delegates from Dushanbe left the meeting due to the presence of members of IRPT a public protest held by Group 24, and the general harsh criticism of Tajikistan’s regime. Embarrassed, the authorities soon vented their rage against the families of these dissidents, including Shabnam. On 20 September, a crowd of students, teachers and local journalists burst into the school in Kulob where Shabnam’s daughter studied. When they found the nine-year-old girl, they began to shout at her hysterically, calling her the “child of an enemy of the people and extremist”. The next day, a crowd gathered outside her family’s home, where they threw stones and beat her relatives, including her 10-year-old niece, when they tried to prevent the crowd breaking in. “We’ll burn your house down!” they shouted. Shabnam Khudoydodova discusses the deteriorating human rights situation in Tajikistan at the OSCE’s conference in Warsaw, September 2016. Photo courtesy of S. Khudoydodova. Two days later, protesters targeted the family of Ilhomjon Yakubov, a high-ranking member of the IRPT. Yakubov had participated in the OSCE session on human rights in Tajikistan, and his family in Khudjand was attacked. After the authorities threatened to seize their property, Yakubov’s family fled the country in October. Yakubov was a high functionary in the IRPT, while Shabnam was a former migrant worker with less prior experience of activism. Yet the Tajik government has been merciless in its pursuit of both. The thin red line is ever-thinning — and it doesn’t matter who you are if you cross it. As reported by Human Rights Watch, these attacks on activists’ families was orchestrated by Tajikistan’s security services. Attempts by Shabnam’s mother to complain about the lack of investigation by the police by Shabnam’s mother were only metwith further threats. “They’ll kill your daughter soon, don’t let her get the wrong idea – if she believes she’s safe, she’s deeply deluded. She should shut up, or she’ll die,” warned the head of the local police station in Kulob. Shabnam’s nine-year old daughter doesn’t go to school anymore. Her mother believes this to be by order of the Tajik authorities. Four days before the publication of this interview, Shabnam noticed two Tajik men following her on the street. She continues to receive threatening phone calls to her apartment, several of them in Tajik. Shabnam doubts that her country has a bright future. Happiness, is neither around the corner, nor the Pamirs. Before we leave, she laughs — loudly.